Are you wondering how the social media landscape is changing for users? Wondering where you should focus your social media activities? Pew Research has released a brand-new study, which shows how American users have diversified their social media use. 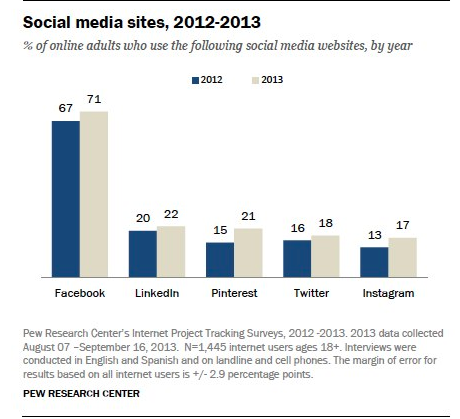 The Pew study indicates that overall, Facebook continues to be a favorite, but 42% of online adults use two or more social networks. Among those who use just one social platform, 8% use LinkedIn, 4% use Pinterest and 2% use Twitter or Instagram as their platform of choice. Facebook still popular, but the grass is getting greener on the other side. Facebook remains popular because everyone’s friends and family hang out there, and because of its social graph. Other than that, users (and marketers) are constantly frustrated by the way Facebook changes the rules of engagement or the content layout. The result is that users start to feel like the “grass is greener on the other side” and are drawn to other sites, which quickly develop their own demographically unique user base (e.g., teenagers on Snapchat, women on Pinterest, business executives on LinkedIn, etc.). The challenge for Facebook marketers is to succeed on an increasingly turbulent channel, while trying to hold the attention of multiplatform users. Under these circumstances, your best bet is to diversify your content marketing strategy and engage with customers not just on Facebook, but also on every other channel where they hang out. The research also shows that Instagram has incredibly high user engagement rates, especially when compared with Facebook. More than half (57%) of Instagram users use the app on a daily basis (63% for Facebook) while 35% do so multiple times a day (40% for Facebook). That’s a shipload of loyalty for such a small site! 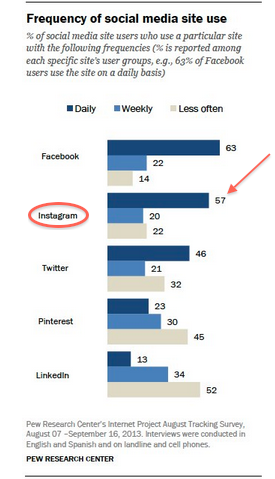 Instagram’s user engagement rates are comparable to Facebook’s. Instagram is becoming a significant platform for brand marketers to leverage because its user engagement rates are so high. Users on Instagram are even interacting with brands that do not have an official Instagram presence. For example, Chanel does not have an official Instagram account, but it has more than 2.7 million images that have been branded with the #Chanel hashtag. First, experience Instagram as a user, not just as a marketer—sign up for a personal account to experience what other users see when they engage with your brand. Choose photos that bring out the “feel and lifestyle” of your brand. Launch a campaign or photo contest to get your audience excited about sharing brand-relevant photos, which you can curate and display on your website or Facebook page. Since you’ll be aggregating photos through hashtags, choose hashtags that are unique, simple and relevant to your brand. Avoid blending too many words into one hashtag (Instagram users love simplicity). Add captions that lend humor, wit and context to your photos. Link photos to your product pages to encourage consumers to go directly to your store and make a purchase. Reward your followers for viewing and sharing your pictures with a discount or a promotional code. 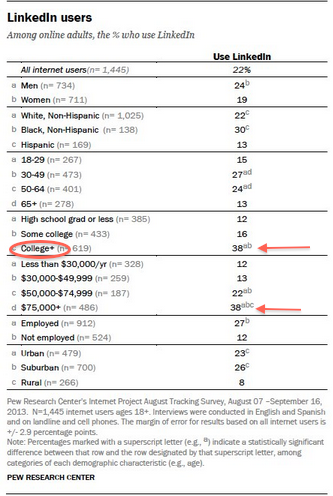 LinkedIn usage continued to be dominated by high-income earners ($75,000 annual salary) and college graduates. It’s also the only social networking site with the highest usage among 50- to 64-year-olds (think business executives and decision makers). LinkedIn users are more affluent and more educated than the average online user. LinkedIn is the place where businesspeople network, show off their expertise and secure new business. Start using LinkedIn’s sponsored updates. Sponsored updates are compelling because they appear directly in a user’s news feed rather than on the sidebar, making it more likely for your audience to notice and interact with them. Sponsored updates also have the same options as regular updates, such as like, share and comment. Since your business connections will already be looking at what you have to offer, consider adding sponsored updates to your LinkedIn content strategy so your connections can like, share and comment, thus exposing your content to more eyeballs. Consider using targeted updates on your company page (only page administrators can do this). Unlike regular updates where your message goes out to all of your followers, targeted updates go out to a targeted LinkedIn audience. You can tailor the audience based on specific criteria such as company size, industry, function, seniority and geography. If your company is looking to hire, you can also target non-employees with your content. Women are increasing the amount of time they spend on social media, especially on platforms other than Facebook, according to eMarketer. In the survey, 48% of women said they increased the amount of time spent on Pinterest and blogs, while 67% said the same about Instagram. Only 30% said they’re spending more time on Facebook. Women are spending more time on social channels other than Facebook. For most women, social media is about family and friends. But they also want to be notified about coupons, promotions and shopping deals. In other words, women have a dual personal-commercial interest in social media. They tend to mix their personal and commercial interests into one feed; for instance, posting family photos, talking about their kids and asking for advice about a product. So the best way to interact with women is to humanize your brand and create a social presence they’re willing to connect with (especially on a platform like Pinterest, which is more trustworthy to women). It’s also a good idea to plan an integrated campaign because all of these social channels feed off of each other. If a potential customer sees your campaign on Facebook, Pinterest and Instagram, she’ll remember it, therefore making it more effective. Just make sure your content is entertaining, shareworthy and not disruptive. What do you think? How have these insights prompted you to improve your social media marketing strategy? Please leave your questions and comments in the box below.